Converting black money to white is very common today. People use all illegal method to convert black money to white. This article is written to expose ways which people use to convert black money to white. I no way encourage any taxpayers or anyone to use any of the below methods. Popular method people use to convert black money to white is by showing bogus loan entry. Modus operandi under this case will be people give black money to friend or relative and take a cheque from them. This is kind of bogus loan entry to convert black money to white. In some cases people give repayment of this loan by giving back cheque. People doing this must understand that Income tax department is watching every transaction and tax payer have to prove genuineness of every transaction. Another popular way used by people to convert black money to white is by formulating trust for social cause. They make executive bodies of own people in trust sometimes illiterate people like driver cook etc. They donate black money to this trust as charity to convert black money. On paper it is charity but off the shelf it is conversion of black money to white. Another popular way of converting black money in to white is by showing income as agriculture income. In order to show income as agriculture income you must possess land and it must be used for agriculture purpose like plantation, garden nursery etc. However there are various conditions you need to satisfy in order to claim agriculture income. Another popular way to convert black money to white is by showing income in cash. Income from tuition, professional fees or commission is shown as cash by many tax payers it is nothing but converting black money in white. Also Read – How Salaried Person can maximize tax saving? Go to known jeweler and give him all black money you want to convert. He will give you cheque for the same amount. He will also give you purchase bill showing you sold your personal Jewelry to him. By this way your Black money is converted to white and you need not to pay capital gain tax even. Another method people use to convert black money to white is by making investment in cash. People purchase insurance policy and pay premium in cash. For example if insurance premium is 50000 Rs/- payable quarterly, than people pay first premium via cheque and rest all premium in cash. 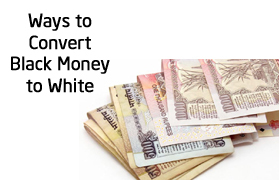 This is most simple and popular way to convert black money in white. Another popular way to convert black money to white is by getting gift from relative. Modus operandi is simple you have black money and your relative has the same amount of white money. Your relative issues cheque to you as gift and you will give your black money to him/her. Another popular method for converting black money to white is to open bank account on each and every individual family member. Deposit black money on the name of every family member to convert it in white. Real estate is sector where majority of black money is parked. People use real estate deals to convert black money to white. It is observed that people do fake real estate deal exchange money and cancel these deals due to non-payment of money. Best method for converting black money to white as per me is by declaring this money to IT authorities and paying tax on this money to convert it in white. I don’t recommend readers to follow any of these methods for black money conversion. This article is just for exposing loop holes of our system. So, that RBI and the government can take appropriate action by formulating strict rules to remove black money from India. I am against black money and black money generation ideas. If you have any information about people holding a black money and trying to launder it. Please send email on blackmoneyinfo@incometax.gov.in This email id will be monitored by special cell and immediate action will be taken on information sent by you. Let’s help government to fight against black money and tax evaders. If I have missed any other methods which people use to convert their black money into white money I request you to share it in comment section. Let’s fight against black money and corruption. in gujarat, the situation is somewhat different. The party who has black money has taken commission from the person whoo possess white. Black possessor takes 7% commission from the white possessor. i.e., a person who has Rs 100 white and gives it to black possessor, then black possessor takes his Rs. 100 white and gives him black Rs. 90 in return. What is the reason behind it? Why white possessor wants to turn it into black? Probably to invest in real estate. Dear Renukar, You need to applicable tax on amount declared by you.If it is high amount more than 10 lac rate will be 30%. if i invest black money in credit co-operative society for convert to white can i do it? Money which you deposit in account account you need to pay tax or declare as your income so that it will be treated as white money. We do have contacts with Trust(Hindu / Christian) in Tamil Nadu. If you are interested to move your money to india. Please let us know. thanks for the writing on black money white money conversions. I want to invest money, so will u tell me best invest planning & in which sector, organisation or company for best return. How much you can invest .we hav lot of govt projects in Karnataka State.